The rivalry with Northwestern that was prevalent in the 1920’s, 30’s, 40’s, 60’s, and 70’s has made a little comeback. On Saturday, the Irish will face the Wildcats for the second time in 5 whole years. Even better, this will be Notre Dame’s first trip to Northwestern’s campus since 1976. It’s been an up and down year for Northwestern after opening up with a road win at Purdue followed by 3 losses in a row, including a tough one to a mediocre Akron team out of the MAC. The Wildcats have since rebounded for 4 straight wins and come into Saturday night feeling pretty good having upset divisional rival Wisconsin last weekend. I sometimes joke with our writers that Pat Fitzgerald will be the next Notre Dame head coach. Even if it’s unlikely (he’s probably in the mix somewhere depending on how deep your list would be) his resume continues to be strengthened at tradition-poor Northwestern. It’s pretty much been a mini-Renaissance for the Wildcats featuring a trio of 10-win seasons since 2012 and numerous upsets of better programs. Just last week, Northwestern took out Wisconsin which isn’t a huge deal on its own as the Badgers are struggling to meet their usual standards but it was the 4th win for the Cats in the series under Fitzgerald. Let’s not forget Fitzgerald was the star linebacker in the 1995 upset in South Bend and as coach took out the Irish in the last meeting back in 2014. Does he have some mojo against the Irish? Some Irish fans will spend a lot of time drooling over Northwestern’s grass field where the litmus test for such wonderment is actually being a grass field. Standards need not apply. Like many natural surfaces in the north of the United States, the Wildcats are forced to grow the grass out to give the playing field more sturdiness. Except, Northwestern has been known to keep an extra long cut especially when better football teams come to town. Just as long as this field makes old white men feel tough, we’re fine. 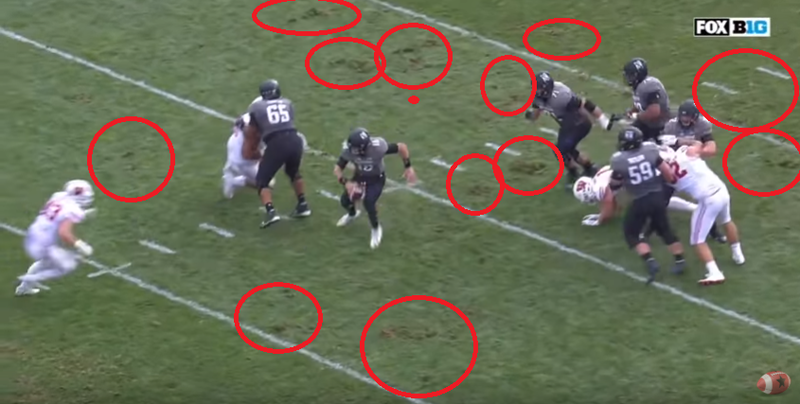 The grass looks fine from the high field shots during live action but if you watched last week versus Wisconsin you’ll see plenty of issues when large men with spikes are running on shaggy grass. The field is actually really sloppy and slippery with big divots flying all over the place. Remember those times in Notre Dame Stadium? Zaire bobbled an extra point which was taken back for 2 points by the visitors. A pass from Golson deflected off offensive lineman Christian Lombard’s helmet, got picked off, and returned 65 yards to the Irish goal line. Golson fumbled an exchange and lost the ball inside Northwestern’s 10-yard line. Chris Brown lost a fumble at the Northwestern 1-yard line off a jet sweep. Of course, who could forget the failed 2-point attempt while leading by 11 points with 10:34 remaining. Cam McDaniel fumbled with 1:30 remaining on 2nd down as the Irish were up 3 with Northwestern already burning timeouts. Two plays later, Northwestern fumbled right to the feet of Matthias Farley only to see Max Redfield dive in and bounce the football out of bounds. Normally steady senior kicker Kyle Brindza missed from 38 yards and 42 yards, the latter coming in overtime. And finally, Northwestern kicker Jack Mitchell had never hit a field goal longer than 29 yards and made kicks from 31, 46, 45, and 41 with the last being the game-winner in overtime. In short, a much worse version of 2018 Notre Dame–with Brian VanGorder coaching the defense–needed a crap ton of stuff to go wrong just to lose in overtime to Northwestern. LB Blake Gallagher – The true sophomore came out of New England prep blue-blood St. Sebastian and is now the leading tackler for Northwestern. He’s tied for the lead for the Big Ten lead in tackles, and being from Massachusetts, there’s a 63.6% chance he grew up a Notre Dame fan and has been receiving revenge indoctrination from Fitzgerald for the past two years. Be prepared for the broadcast to mention this background many times if true. QB Clayton Thorson – Northwestern’s running game is an abomination with 729 yards (127th nationally), 2.58 yards per rush (128th), and slotted as the 114th best rushing attack according to S&P+ metrics. In all likelihood, they will be abandoning the run game early if they ever truly attempt to force it on Notre Dame. Thorson, now a senior, is likely to throw. A lot. He’s averaging 39.8 attempts per game which is 5th most in the entire country. This should be entertaining either way! The narrative for the Syracuse game is super strong as many have accused the administration of essentially opening the door to an avoidable loss. The Irish moved a home game to Yankee Stadium, will be wearing ridiculous uniforms, and are facing a type of explosive offense that will be difficult to prepare for down the stretch. We all know the history of USC as the spoilers. 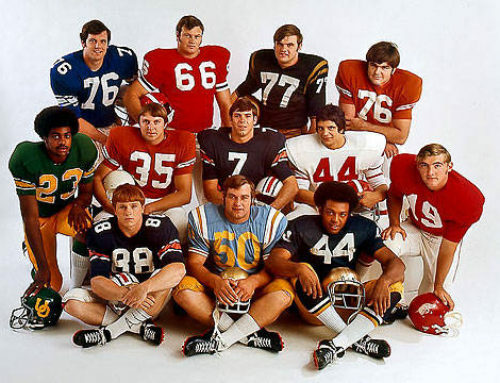 Many a great Notre Dame teams have gone to Los Angeles and came away with a loss from supposed inferior Trojan teams. Both Syracuse and Northwestern have recent experience toppling Notre Dame as an underdog, too. The coaching really seems to favor Northwestern, and to a lesser degree, Syracuse. Who knows what’s going on with Helton and Taggart soon. One week of football could drastically change their futures in either direction but their situations are definitely volatile to say the least. The issue of motivation is interesting because as of right now everyone would love to spoil undefeated Notre Dame’s season. At this point, Florida State only has pride backing that up which isn’t too convincing following their embarrassment against Clemson. Additionally, USC could be even deeper into a “Fire Clay Helton” barrage from the media in the coming weeks–that doesn’t bode well for a valiant effort in the regular season finale. I guess Northwestern has a little bit of motivation in the sense of these schools being close to each other, within the same academic profile, and probably not a whole lot of love lost between each side. Meanwhile, Syracuse should be 8-2 when they meet Notre Dame in Yankee Stadium following a road trip to Wake Forest and home date with Louisville. The Orange will have a lot on the line most likely when that ball kicks off in the Bronx. However, the one thing we haven’t factored in yet is the vaunted post-Navy hangover for Notre Dame. Using my super scientific measurements above is that worth 2 points for Northwestern? Maybe 3 points? Under the direction of Brian Kelly the Irish are just 4-4 following the Navy game, and even worse, 2-6 covering the spread. We can zero in on the 2011 and 2012 seasons when Notre Dame soundly defeated Navy (just like this past week) only to spin their wheels in close and ugly victories over Wake Forest and Purdue. That was a long time ago, though. The Irish are 2-1 post-Navy over the last 3 years with one of the better program wins over USC in 2015 and a blowout win over Army (just 11.5 point favorites which is weird in hindsight but 2016 was a cruel mistress) in a game that was never close. The loss against Stanford occurred last year but that didn’t feel like it was really much of a hangover game. So, if the Navy hangover exists I think it’ll be of the mild variety, perhaps worth a point or two in Vegas which isn’t nothing but just not a major driver for an upset. The good news looking over those games is Notre Dame only gave up less than 14 points per game. 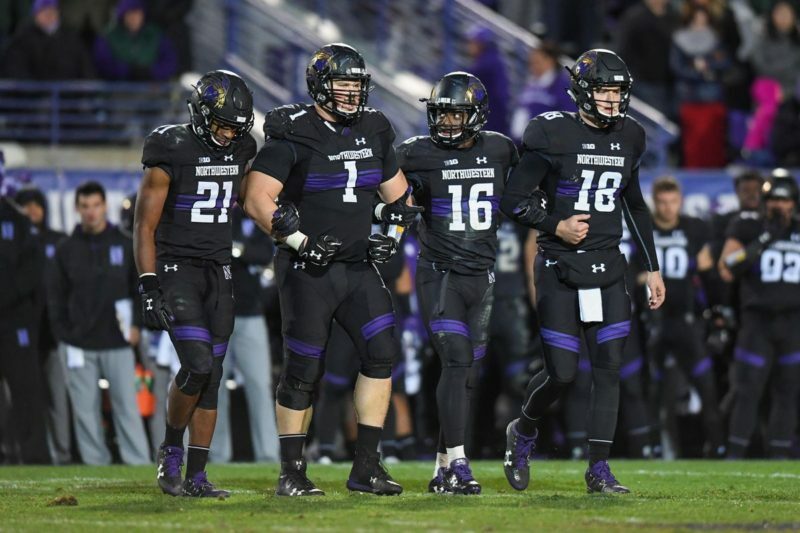 The bad news is that 5 out the 8 games were close in various forms and if you’d like to be scared the 2014 Northwestern offense was ranked 100th and nearly piled up 600 yards. Then again, we have to factor in Brian VanGorder and in a way this makes me feel better about this weekend. With the 2014 upset Northwestern was similarly ranked by S&P (69th then vs. 64th now) as this weekend, although the gap between the Irish then was 38 spots. For this Saturday, it’s a 58-team gap (maybe even larger given the Irish are still working off their Wimbush offensive ranking early in the season) and Notre Dame’s defense is now organized and knows how to tackle the opponent. I can see a close game but arguably even worse stuff than the 2014 meeting has to happen for Northwestern to score significant points and that’s a lot to ask in an attempted upset bid. Thanks for the reminder of how much went wrong in that last Northwestern game. I remember it being ugly, but I forgot about how many mistakes / bad breaks there were in that game. 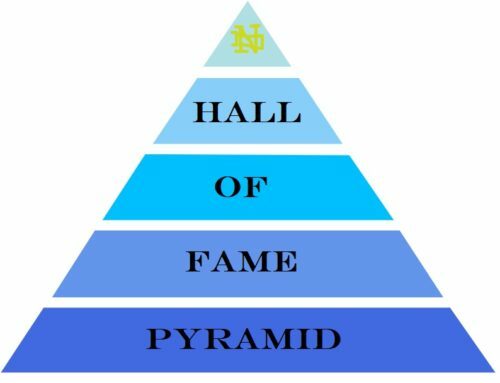 Let’s hope that ND drank lots of water and electrolytes (“it’s what plants crave”) so that they can avoid the Navy hangover! The ONE thing I’m trying to keep in mind for the Syracuse game is that maybe we’re not as dumb as we think (okay, we are, but maybe it works out): Cuse plays in a dome. The game will be outside in the cold. I mean sure, Cuse players know what snow is unlike FSU, but so do the Minnesota Vikings and it seems to still bother them in the playoffs. See, I can be optimistic! I believe the game was moved from South Bend not Syracuse. That’s right. Dangit…okay, so it’s still a dumb move, but at least it’s not a Cuse home game. Halloween’s over, you really didn’t need to drag out the horrific, gory details of the 2014 game. In all seriousness, I forgot about half of that stuff. Really only the 2 point attempt and the Cam fumble stick in my mind. That’s a gross abomination of a football game right there. Also, of those 729 total rushing yards for Northwestern, 346 came from Jeremy Larkin, in the first 3 games of the year, who then retired due to injury. They haven’t rushed for more than 3.7 yards per carry in a game since then, and they’ve actually rushed for less than 1.5 yards per carry more often than not. That’s crazy bad! This should be a game dominated by the ND defense. Fitzgerald is a good coach though, and I’m sure will have some tricks up his sleeve to create offense – like the VT called back WR pass, quick decisions to go for 4th downs, hell even an onside kick. Also anticipate them targeting the nickel and Genmark-Heath or White in pass coverage when possible. I went to the Purdue-NW opener, and Thorson clearly wasn’t healthy in that game and Larkin was, but their offense was just very horizontal. Almost all quick hits, very little vertical stretch, and no skill position guys (especially now with no Larkin) that really scare you. Feels like a very big game for the OL. If the run game is doing enough and Book is comfortable, this can be a game that is a statement. The Cats are not at all built to come from behind, and haven’t even been very good offensively after building a big lead. Will be interesting to see how much “bend but don’t break” we play versus being aggressive against an offense built on short throws and without scary WRs. (1) Northwestern’s run game showed a pulse against Wisconsin (I have no idea if this is true but that’s what he says, apparently after Larkin’s exit a frosh has stepped up). (2) They have been good lately with their NFL-caliber QB stretching the field vertically. BK said that good D-line play was critical (here I interpolate) to snuff out the Cats run game and to not allow the deep ball. Not saying you two are off, I was just struck that BK was stressing somewhat juxtaposed interpretations. Gotta have something to sell the lads to keep them focused. The Irish Illustrated guys were talking about BK calling Thorson an “NFL-caliber QB” and straight-up called that coach-speak. Thorson has NFL height and size, but he’s not “good.” One of them pointed out that he had a good first season when he was a freshman or sophomore or whatever, but basically hit his potential and hasn’t gotten any better since then. His stats aren’t “NFL-caliber,” even Josh Allen-caliber. Sure, D-line play is important and you make sure the guys stay focused, and some stupid NFL team may draft Thorson because he’s 6-4 225 or whatever and NFL teams don’t watch players actually play, but if Thorson goes off on our defense it will be a surprise. Thorson – 60% completions (good) 10 TDs 10 Int (poor)……I don’t care if he can play in the NFL, I’m only worried that he doesn’t play well tonight. I think Tillery, Okwara and Kareem take care of that. If Northwestern beats Iowa next week, they’re almost guaranteed a spot on the B1G championship game. There will be some momentary excitement, because ooh! ND! but with a stadium filled with 50% blue and gold instead of purple, I don’t think it lasts long. 45-21, and we all get pissed because it’s not pretty enough, and then the media on Sunday morning talks about how we blew out a team competing for the B1G West title and who beat Wisconsin and was on the cusp of being ranked. Perhaps that’s because everyone will be watching LSU-Bama and will only look at the final score for us, but that’s fine. I don’t know what comment you’re referencing, but I couldn’t care fewer. Need more Thrones in my life, whether it be novel or screen. Glad I’m not the only one with withdrawals. Has there been any Tranquill updates? So I don’t know it that’s reading too much into that last part to say Tranquill is out or if he will be a part of the rotation. I don’t know too many people that can recover from a high ankle sprain and play linebacker in 6 days though, may be the only course to have him watch. Bilal to LB? He’s been good on the run. Then maybe a rover who can defend the pass better? Not sure if said player exists so I guess it will be a wait and see type thing. Just heard on game day that he’s a game time decision too. Likely not playing and we need to hope he’s back by the Syracuse game which given the injury is going to be tough. Wouldn’t be surprising if he missed the remaining regular season games. Can we get the game thread up in the Slack because holy crap I need a place to talk about whatever the heck that non-side kick was by Nebraska.